Few things in life are more anxiety-inducing than being trapped behind the wheel of a moving vehicle with a child who's about to lose her lunch. Who knows why some parents suffer while others go unpunished, but if you're one of the unlucky ones with motion sick kids you know perfectly the dread that hits when a little voice in the backseat says, "Mom, I don't feel so good..."
Your stomach drops into your shoes. Your pupils dilate. 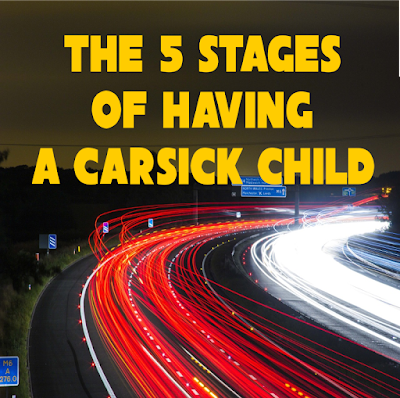 And you begin to work your way through the 5 stages of having a carsick child. It's fine. Hardly worth acknowledging, really. After all, you're a mom, and your little people are always complaining about some minor ailment every 5 and a half seconds. Wasn't this particular child just moaning about a bump on her lip, and a few minutes before that it was a week-old cut on her finger? Whatever. It's nothing. She's said it two more times now, and your knuckles are turning white from anxiously clutching the steering wheel. Why does this always happen when it's you driving and not your husband? Why were you so stupid to let her read a book in the car? Why didn't you bring some wipes or plastic bags or something to clean up? And more importantly, WHY ARE THERE NO EXITS ON THIS FREEWAY?! You curse yourself, your husband, your dog, the state highway department, and every single character in that miserable book in your child's lap. Don't panic. Maybe you can still fix this before it's too late. Your voice climbs one, two octaves as you beg your child to focus on anything other than how queasy she feels. What if you roll down the windows and get some fresh air? Want to play the alphabet game? The license plate game? Is it too late for Dramamine? You start yelling at the other kids in the car. Quiet down and fan your sister's face! You'll buy a pony for whoever can stop her from puking all over the upholstery. The fresh air isn't working. In fact, it's made her feel worse. Your shoulders have begun to droop as hope has slowly and steadily leaked from your soul. Despondently, you look in the rearview mirror to see your child slumped in the backseat with her head lolling back. She is literally turning green. Abandon all hope, ye who enter here. You realize now you've been simply postponing the inevitable. A strange resolve creeps back into your posture. It's going to be okay. You've cleaned this up before and you can do it again. You are strong. You are a warrior. And best of all, you see an exit up ahead. "Sweetie," you say, your voice brightening, "We're getting off the freeway. Can you hang on until we pull ov-"
Never mind, she's already completing the second leg of her round-trip meal ticket. Pandemonium ensues as the other kids try to heave themselves through the windows of the still-moving vehicle to get away. Oh good golly all the feels, chills and desperation of having children with car sickness just came rushing back. No car rides this holiday for us, hooray! Yes. Unfortunately this is exactly what my life looked like coming home from Thanksgiving. So funny and SO TRUE. As the mom of a very carsick child, and I can back you up 100% on this. But really, it only happens when there are NO EXITS ANYWHERE EVER. That was me as a child! Now that I drive, I NEVER have to be in the BACK seat again!! Thank God my kids, and my grands are not!! I'd be heaving right along with them! That's the worst, when it starts a chain reaction!